In the Journal of the American College of Cardiology, Dr. Newby and colleagues from seven professional societies, led by the American College of Cardiology, released a consensus statement to help clinicians determine when to order troponin testing and how to interpret results. The document provides a framework for clinicians to interpret results of troponin testing in a useful mechanism-based construct. According to the consensus statement, physicians should adopt the definition of MI that was recently updated in order to fully understand the implications of elevated troponin levels. “The universal definition of MI, which was updated in 2012, is important because it provides a standard framework in which to apply troponin testing for a diagnosis of MI and emphasizes not only troponin levels, but also the importance of clinical symptoms of MI,” Dr. Newby says. In addition, the consensus statement provides recommendations for troponins in acute coronary syndromes (ACS), in non-ACS ischemic syndromes, in PCI and CABG, in nonischemic clinical conditions, and in other non-ischemic conditions in which interpretations can be uncertain. “The most important nuance to understand is that elevated troponin represents the likely occurrence of myocardial necrosis and does not, in and of itself, provide any indication of the etiology,” says Dr. Newby. “Interpretation of troponin test results must consider the clinical context in which the measurement was made.” For example, interpretations of positive troponin levels in patients presenting with ischemic chest pain will be different from those of patients undergoing PCI or CABG or presenting with other distinct symptoms. The consensus statement provides several tools for clinicians, including a summary of answers to frequent questions regarding the use of troponin in the clinical setting (Table). In general, troponin evaluation should be performed only if clinically indicated for suspected MI because it is not specific for MI. Elevated troponin levels should always be interpreted in the context of clinical presentation and pre-test likelihood that it represents MI. Another key recommendation from the consensus report is that troponin testing should be used for a diagnosis of MI in chronic kidney disease (CKD) patients with symptoms of MI, regardless of their severity of renal impairment. Dynamic changes in troponin values— 20% or more over 6 to 9 hours—should be used to define acute MI in end-stage renal disease patients. In the absence of specific interventions based on results, routine troponin testing is not recommended for nonischemic clinical conditions. The only exceptions include FDA-approved troponin testing for making a prognosis in CKD patients and treatment of patients undergoing chemotherapy who have drug-induced cardiac injuries. Newby LK, Jesse RL, Babb JD, et al. 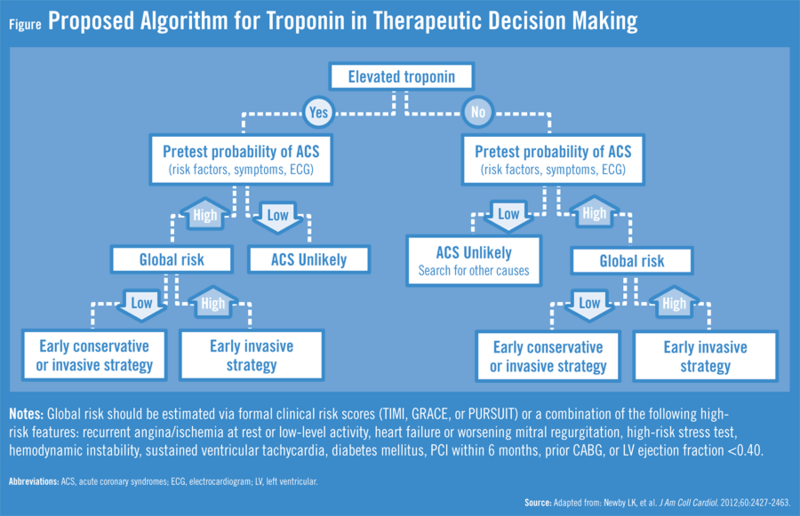 ACCF 2012 expert consensus document on practical clinical considerations in the interpretation of troponin elevations: a report of the American College of Cardiology Foundation Task Force on Clinical Expert Consensus Documents. J Am Coll Cardiol. 2012 Nov 12 [Epub ahead of print]. Available at: http://content.onlinejacc.org/article.aspx?articleID=1389700. Newby LK, Roe MT, Chen AY, et al. Frequency and clinical implications of discordant creatine kinase-MB and troponin measurements in acute coronary syndromes. J Am Coll Cardiol. 2006;47:312-318. Babuin L, Jaffe AS. Troponin: the biomarker of choice for the detection of cardiac injury. CMAJ. 2005;173:1191-1202. Heidenreich PA, Alloggiamento T, Melsop K, et al. The prognostic value of troponin in patients with non-ST elevation acute coronary syndromes: a meta-analysis. J Am Coll Cardiol. 2001;38:478-485. Apple FS. A new season for cardiac troponin assays: it’s time to keep a scorecard. Clin Chem. 2009;55:1303-1306. Alcalai R, Planer D, Culhaoglu A, et al. Acute coronary syndrome vs nonspecific troponin elevation: clinical predictors and survival analysis. Arch Intern Med. 2007;167:276-281. Keller T, Zeller T, Peetz D, et al. Sensitive troponin I assay in early diagnosis of acute myocardial infarction. N Engl J Med. 2009;361:868-877. Latini R, Masson S, Anand IS, et al. Prognostic value of very low plasma concentrations of troponin T in patients with stable chronic heart failure. Circulation. 2007;116:1242-1249. Morrow DA. Clinical application of sensitive troponin assays. N Engl J Med. 2009;361:913-915. L. Kristin Newby, MD, MHS, FACC, FAHA, has indicated to Physician’s Weekly that she has several financial disclosures. This information is available online at https://www.dcri.org/about-us/conflict-of-interest/Newby-COI_2012-2013.pdf. a cath. Performing doc said I could drive a Mack truck through your arteries. In 9/16 while driving, I experienced pain in went to closest ER. Based on chest pain, abnormal EKG (which proved to be my normal EKG in a f/u visit with the NP of the cardiac) group, and serial Troponin levels – .07, .06, .06, the schedule me for a Cardiac angiogram. When told me that, I started to somewhat disagree. I told that I had a Cardiac angiogram before with results being heart healthy.